OEM leads are sent directly to your system for the most accurate tracking and response time reporting. Want to improve your OEM response time? ProMax has you covered with customizable lead activity monitoring and reports. The ProMax ILM system is configurable to your sales process, and works equally well for large dealerships with multiple rooftops and small car lots alike. Set up and manage each lead source differently, assigning leads to specific salespeople, staff on the lot, or use a round-robin system. We offer a variety of auto-responder options that effectively communicate your message to prospects. Dupe leads shouldn’t equal dupe payments to lead providers. ProMax tracks and identifies your duplicate internet leads by source, and our robust ILM tool allows you to determine the type of dupe match that is performed and what action is taken. This powerful feature prevents you from having to pay multiple vendors for the same leads. ProMax comes with easy-to-use reports for tracking individual leads and lead sources that make end-of-month review a snap. Receive and respond to lead notifications directly from your mobile device. 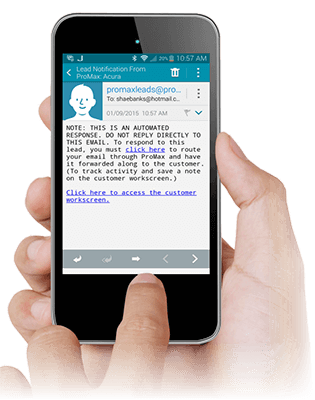 Set up ProMax to alert you via mobile or e-mail when leads are not being responded to by sales staff within a certain timeframe. Set up alerts to be triggered only during store hours, or any time of day or night (required by some OEMs). Stop the clock on leads directly from your smartphone or tablet and navigate to the Mobile Workscreen to begin working the lead immediately.